This coloured photo of RIVER NIGER laid up in Tilbury. She was there for a number of years and the local supermarkets helped to feed the unfortunate crew. 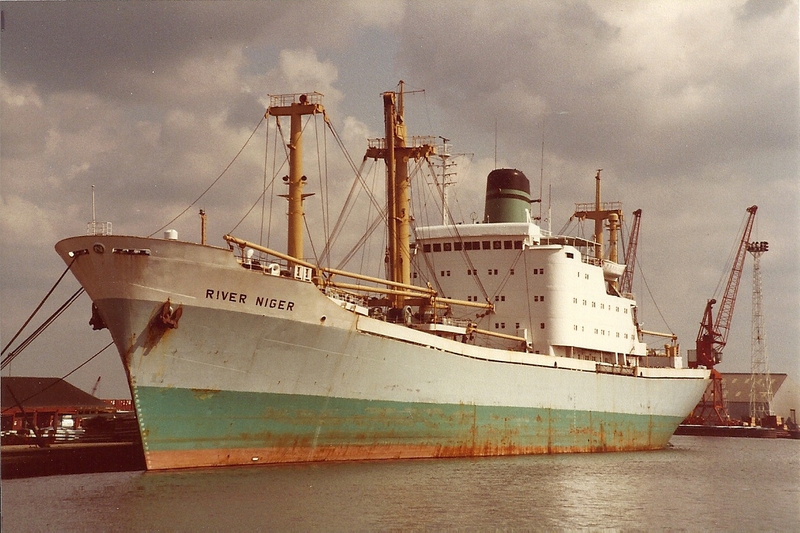 This was one of several ships of Nigerian National Shipping Line that entered service in the later 1960s. It was down to the RIVER NIGER (built 1968; 7827 tons gross) to become well known in Tilbury docks … but for the wrong reason. The owning company was set up in 1959 following the independence of Nigeria and it had a long-time association with Palm Line. Its first fleet was a mix of good-quality second-hand freighters bought from mainly British companies and for a few years it did reasonably well on service out of Tilbury to West Africa. The company’s very first sailing was out of Tilbury in 1959. 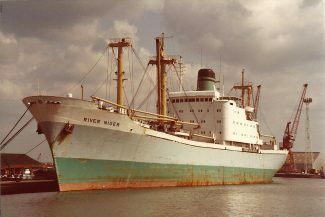 However, in time, NNSL was unable to compete with the European companies involved in the trade and even with massive subsidies from the Nigerian government, the company went into decline in the 1970s with a fleet of modern cargo vessels that were running at only a fraction of economical capacity. Much of the government subsidies were “misdirected” and were not used for intended purposes. Like the rest of the fleet, RIVER NIGER was laid up for a few years while what was left of the company was sorted out. The ship was eventually sold, in 1983, but thanks to lack of maintenance was not in the best of condition and lasted just two more years before it was scrapped. NNSL was formally liquidated in September 1995, by which time there was no tangible assets to its credit.